Booties, booties, booties. No, we are not talking about the latest crazy song on the radio, we are talking about some of the best footwear for the season. Versatile, comfortable, and just downright hot, booties are now being seen worn with everything from business casual wear to weekend comfort outfits to datenight. I have rounded up some of my favorite ways to wear booties and a few options to shop. 1. Short black skirt paired with super low boot? Yes please! Great for shopping around town, these are super comfortable even with the heel. I especially love the detail strap around the top. 2. With comfy rolled up jeans. How much more comfortable can you get than with your favorite worn rolled up jeans and some brown booties? This is screaming to be worn for a coffee date with a friend and by far my favorite way to wear booties. 3. Sweater, black skirt, and black tights = classic fall. Booties with tights are a great changeup from the usual pumps or heels that is typically worn in the colder weather. This outfit utilizes all of the fall color trends starting with the cranberry top all the way down to the brown booties. 4. Bring on the pattern. Who says booties can only come in black or brown? Bringing in a neutral pattern such as leopard print is a great way to add some interesting detail to an otherwise neutral outfit such as black skinnies and a white solid top. Leopard print has definitely been my go-to print for shoes, scarves, and gloves this season. The wedge bootie is an option that takes you just outside the box of the typical booties. This style of bootie, like the ones pictured above, are perfect for a variety of looks including casual or even dressed up with a dress. I love wearing wedges because they are typically more comfortable than the average heel. Here are a few to shop for around the internet. Price shocker of the day? The Target Sam & Libby Marley booties at $39.99! Sold on booties yet? If you have not made the plunge to buy/wear booties I encourage you to do so because although it may take a few times to wear to get over the different feel and look of some great booties (SHOES! Sheesh) you will soon find you cannot live without them. Whether with a comfy fall weekend outfit or as an accessory for a cute black sweater dress and tights, booties are a huge hit this fall season. Expect to see some pictures of me stylin the booties on a blog post coming soon! What is your favorite way to wear booties? Do you prefer the wedge, flat, or heel? 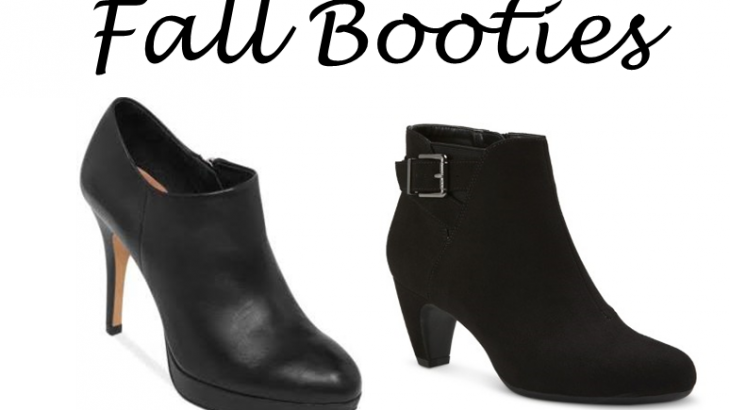 All, Fashion booties, fall, Fashion, Fashion Friday, shoes. permalink.